The Minister of Finance and Coordinating Minister for the Economy, Dr. Ngozi Okonjo-Iweala, has a word of advice for the incoming government- diversify revenue sources. Mrs. Okonjo-Iweala, who spoke yesterday in Washington DC, on the theme: “Beyond the oil” at a forum tagged: “A conversation with Ngozi Okonjo-Iweala”, said the result of the rebasing of the economy demonstrated that there are diverse sources of revenue which the government can tap from. Part of the revelation of that exercise, she said, is that the government can actually increase its revenue profile by depeening and expanding its tax collection drive. In achieving this, she said, the government engaged the services of a foreign tax consultant. The measure brought in additional $500million into its coffers last year. 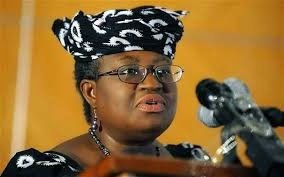 Mrs. Okonjo-Iweala said if consistently pursued, the measure could fetch the government $3billion over the medium-term. Mrs. Okonjo-Iweala, who spared no kind word for politicians bent on spending almost everything that comes into the government’s coffers, stressed the need for the government to rebuild its buffers. She said considerable political will was exerted in the Olusegun Obasanjo administration to set funds aside for the Excess Crude Account and save for the rainy day. The then government was able to pull that through because there was no strong opposition then, pointing out that the vibrant opposition in the present dispensation and the tendency by the governments at the states’ level to always insist on sharing all government revenues, have combined to deplete the Excess Crude Account. “This was not quite right. Sharing of ECA continued, which was not proper,” she said, adding that the depletion continued because the political will the government had changed..
She said the incoming government should also tinker with the option of raising the Value Added Tax (VAT), which in its present five per cent level, she pointed out, is the lowest in the world. Raising the margin by another five per cent, Mrs. Okonjo-Iweala argued, would make a difference in increasing revenue. She said the proposal is already included in the 2015 budget before the National Assembly. “We can look at other taxes, like the VAT, which is in the budget for 2015. We have the lowest VAT in the world, which can be doubled. This can bring another $3billion into the revenue profile,” Mrs. Okonjo-Iweala said, adding that these steps are needed to drive the economy beyond oil.